For a quick example of a Google Apps ePortfolio click here. We are in the very early stages of implementing an eportfolio using the Google Apps platform at my school. This platform was initially chosen mostly because of it ease of implementation, no server, less IT work, automated backups, etc. But the more I use it, the more I feel this could be the next big thing the eportfolio field has to offer. The reason: Collaboration. The google apps suite has all the same tools as most eportfolio systems blogs, file storage, wikis, not to mention a full office productivity line, docs, spreadsheets, and presentations. It also has a chat, text, audio, and video. These tools combined make it a rival to the best of the commercial solutions. But this is not even the best part. Google Apps is designed for collaboration. Any element of an individuals eportfolio, be it a doc, or a wiki, can be shared with another user to be view or edited. 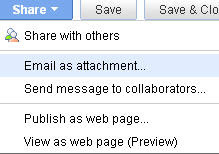 Changes can be subscribed to either via RSS feeds or simply emailed to collaborators. All this supplemeted by synchronous chat can make a true team effort. This ushers in a new era of eportfolios. Most educators agree that the eportfolio is not an end game but rather a work in progress across the curriculum and maybe lifelong. Much is written about formative assessment being a key element of learning and continually improving. Collaboration facilitates this and takes it even further by encouraging teamwork between students and faculty, students and students, faculty and faculty, faculty and administration, administration and students, and you get the point. Google Apps keeps records of previous versions of files so that progress being made can be easily ascertained. What this means for students' eportfolios is that their project is a team effort between them and their collaborators, their faculty and peers. What this means for institutions is that they are able to make comprehensive eportfolios showcasing all of their departments support of standards in one unified Google platform with multiple collaborators. If your school ever had to go through the accreditation process, you know exactly what a headache it is to have multiple emails with messy attachments, and nothing ever being materialized. Now with the power of collaboration you plant a seed and watch it grow. Before you know it the individuals, the departments, the entire school is unified under a common set of standards, a web of collaborators. Neat documented, and everyone was included. Real dialogue, real formative learning, and comprehensive showcases.